Our state government created Texas Enterprise Zones, areas of underinvestment, places of distress targeted for rejuvenation. This economic revival comes in the form of state sales and use tax refunds. These reimbursements are based on how much a company invests and the number of jobs a company creates. Job and investment requirements fall in the chart below. Besides these investment requirements, a municipality must nominate the company to the state government. The city of Houston may nominate 9 areas every 2 years. Other details about TEZs from the Texas website are listed in bullet points below. For more information to to: https://businessintexas.com/. A local community must nominate a company as an Enterprise Project to be eligible to participate in the Enterprise Zone Program. Texas law limits the number of allocations that may be awarded to local communities per biennium. In order to qualify a project for the Enterprise Zone Program, local communities must offer incentives to the project such as tax abatement, tax increment financing, or one-stop permitting. Communities may nominate projects, for up to five years, non-inclusive of a 90-day window prior to the application deadline. Employment and capital investment commitments must be incurred and met within this timeframe. 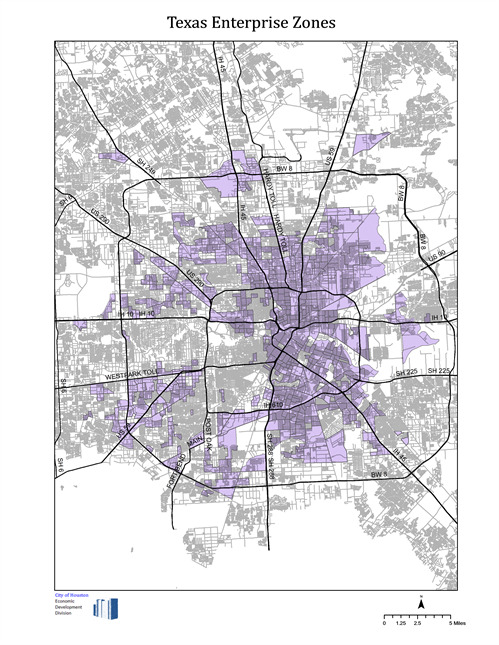 If located within a zone, the company commits that at least 25 percent of their new employees will meet economically disadvantaged or enterprise zone residence requirements. If located outside of a zone, the company commits that at least 35 percent of their new employees will meet economically disadvantaged or enterprise zone residency requirements. Under limited statutory provisions, an enterprise project designation may be granted for job retention.